While Game Of Thrones’ Jon Snow proved he didn’t know nothing about sketch comedy, exactly, last night’s Saturday Night Live worked to find ways to fit the game Kit Harington into the fun. Naturally, there was some Game Of Thrones material for him to fall back on, with co-stars Emilia Clarke, John (Samwell Tarly) Bradley, and real-life wife Rose Leslie (and Pete Davidson’s insecure Night King) popping up to pester him in the monologue, and a single, jam-packed GOT sketch for the rest. Therein, Harington essayed Snow (having to glue on a fake beard, since the actor has relievedly shaved his Northern locks) in a suspiciously Riverdale-esque Game Of Thrones spinoff called Castle Black, where the moody Snow tries to brush off his undead white walker girlfriend, despite their whole simpatico “being dead” thing, and her seductive, if skeletal, disrobing. 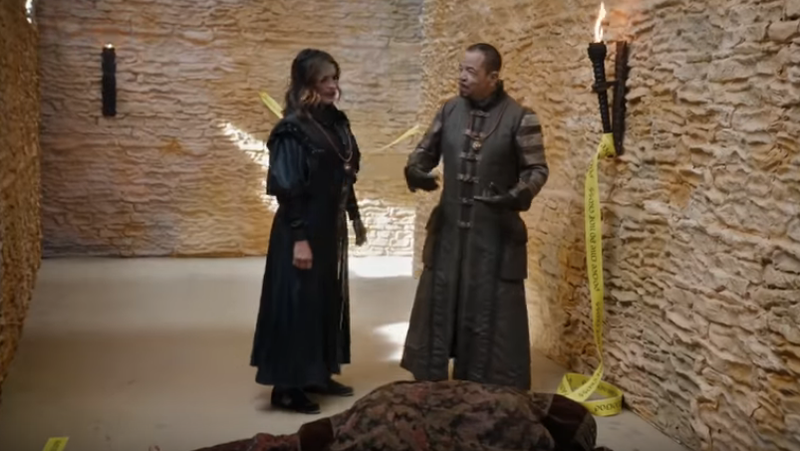 From there, it was essentially every Game Of Thrones-related gag the writers room had in a hat, as the commercial touted coming guaranteed money-makers like the Paw Patrol-look animated kids show Dire Guys, a Hodor-starring Pee-Wee’s Playhouse, and the Daria/Arya cartoon mashup that we definitely would binge the hell out of.